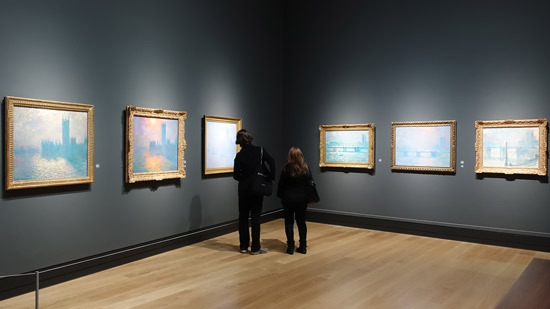 I highly recommend, if you're in London this summer, that you go and see Monet and Architecture at the National Gallery - until 29th July. 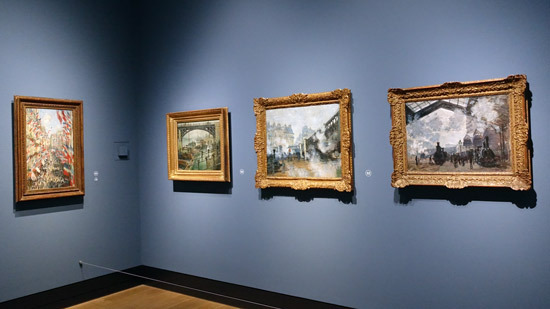 The 75 paintings in the exhibition spans 1860 - 1912 and includes series paintings of Rouen, London and Venice and wonderful paintings of places he knew well in Normandy, Paris, the Netherlands and Italy. Some 25% of the paintings are ones in private collections - making this probably the only time you will ever see them. While I'm not 100% behind the curator's analysis of what the exhibition is about, I'm absolutely delighted that there are so many excellent paintings on display - including some of my all time favourites! The thing is Monet did not paint architecture per se - not like those who simply love architecture. He didn't even paint "things". What he was painting was the light and colour around rather large equivalents of squares and oblongs - as per the famous quotation below. Try to forget what objects you have before you - a tree, a house, a field, or whatever. Merely think, 'Here is a little square of blue, here an oblong of pink, here a streak of yellow,' and paint it just as it looks to you, the exact colour and shape, until it gives you your own impression of the scene before you. It was an absolute joy to be able to see the Rouen series from a decent distance so you could admire them all together. However I doubt if you'll be able to do that once the hordes arrive - unless you make a point of going late in the day and waiting until almost everybody has left! That's because I'm very sure this is going to be a very popular exhibition. The National Gallery has been able to assemble some world class paintings from public and private collections from all over the world. Some I have never seen before in exhibitions or books. I must emphasise that no book and certainly no blog post can ever emulate the way these paintings when viewed face to canvas. Some of them are quite extraordinary. 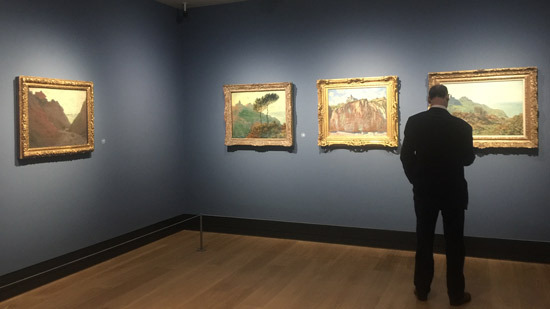 The exhibition is in the galleries in the basement of the Sainsbury Wing - which always seems to be the favoured location for any exhibitions which have enormously valuable paintings! It's very secure. I don't subscribe to the notion that Monet was painting picturesque paintings - of the type that became popular in 18th century England. It doesn't seem to sit well as a theory with a man capable of independent thinking and went his own way in terms of approaches to painting and painting techniques. I think he was just painting what was there. I can be persuaded he was painting "views" that were popular with visitors to the region especially as I think he was always well aware that he needed to sell his paintings. However he tended to avoid the more intensely touristy areas - I tend to think of him as being a bit like all the people who like walking the coastal paths in the UK. In other words he was capturing views that visitors might like. Nothing wrong with that. A lot of painters have done the same before and after. Plus I think he was experimenting with colour and composition. The first room is quite boring. It's a bit like early Van Gogh - interesting to see how artists start out - but the really interesting stuff comes later. Like Van Gogh there is a tendency to browns and greys - his more characteristic use of colour has yet to enter his portfolio. 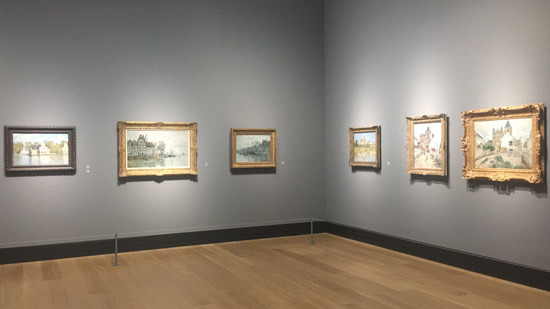 The paintings from his early period 1871-1879 relate to Honfleur, Saint-Adresse, in France and Amsterdam and Zaandam in the Netherlands - with a section of four paintings of Vetheuil where the family moved in 1878. Bear in mind however that he painted Impression Sunrise in 1872 - so a lot of the paintings are representative of Impressionist painting. They just somehow manage to seem quite muted. 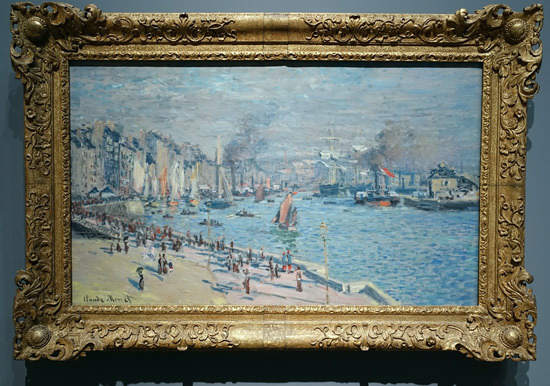 Room 2 however is full of interesting compositions and chromatic contrasts associated with the coastline of Normandy and has more paintings from the early 1880s particularly 1882, when Monet was well into painting 'atmosphere'. Room 2: Normandy coastline - not a lot of buildings! Room 3 includes his paintings of the the coastline at Antibes and the Villas at Bordighera. 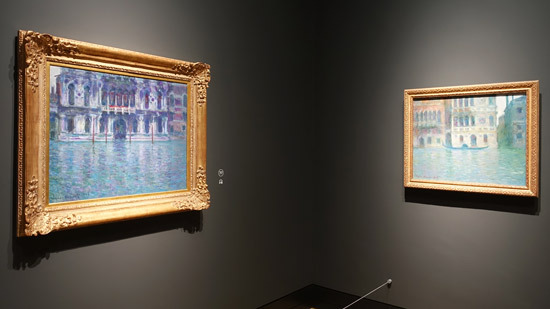 I wrote a whole post about this in Gardens in Art: Monet and the Mediterranean. The whole point is he is not really painting buildings - he is luxuriating in the gardens which are always his first love alongside painting! He is also getting to meet some of the people living in the villas, courtesy of his Durand Ruel, who are very keen for him to stay and paint some more. His paintings of Antibes are some of my favourites - and I've drawn the one at the Courtauld! All in all a very pleasant room and one which I greatly enjoyed. In fact I had to break off in the middle of this post to go and order the catalogue of "Monet and the Mediterranean" exhibition held in 1997 in Texas! "The City' doesn't feature much in Monet's paintings - unless trains or rivers are involved! A couple of paintings I enjoyed a lot included a view which very much reminds me of Childe Hassam - except now I know how he was influenced. Painting cities from hotel rooms and from above shops became his habit in the 1890s and 1900s. 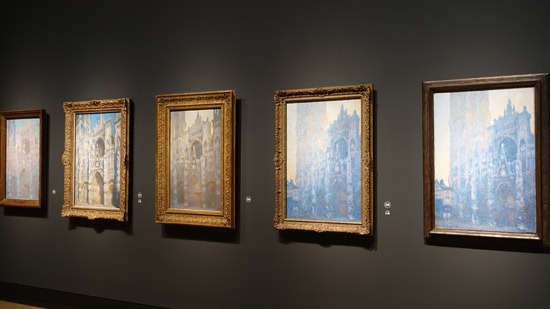 This is my previous blog post about Monet's series paintings - Rouen cathedral. I sat on the bench looking at these paintings for some time. It was a view to savour especially since there not many people left by the time I got to this room. National Museum of Wales "Setting Sun"
I wasn't particularly studying my small catalogue and it took a while for me to realise they are actually hung in time sequence which I think might be the first time I've seen them like this. It's very effective. It's also fascinating to study the very subtle differences between the two on the right painted round about the same time. Impressionists in London - a marketing own goal by Tate Britain!). I was left wondering whether the lighting was maybe better at the National. Certainly seeing these paintings presented as part of a series leaves an impression on you which is quite quite different than that when you see one in isolation. The colours are also amazing and very beautiful and positively luminescent! I spent a long time in the final room - which is all about Venice with three of my all time favourite paintings, two of which (immediately below) I have actually tried drawing - and it's not easy! I am TOTALLY SEDUCED by his paintings of Palazzos on the Grand Canal. These two are two of my absolute favourites. My jaw dropped when I saw that (a) they were in the exhibition and (b) were hung next to one another. I'd come to this exhibition just to see these two and the Rouen Cathedral series. However on the opposite wall were two more paintings - one of which I have also tried drawing (prior to a trip to Venice) and which is another all time favourite - I was drooling by this point! I should add the room also contains three views of San Giorgio Maggiore and two views of the Doges Palace! buy membership - and get to go and see the exhibition again and again! I may be tempted! Gardens in Art continues - with Monet - the project starts with some links to biographical information about the man himself and then some to information about his garden at Giverny. Gardens in Art: Monet and Argenteuil - some of the most famous Impressionist paintings of gardens are associated with the time Monet spent at Argenteuil. Gardens in Art - Monet and Vetheuil - Monet and paintings of the garden at Vetheuil. Gardens in Art: Monet and the Mediterranean - paintings of gardens which Monet did while travelling in the Mediterranean in the 1880s and which preceded the development of the water garden. Gardens in Art: Monet and the flower garden at Giverny - When I visited Giverny for the first time I was immediately struck by the fact that Monet did not only create art with oils. His garden was also an artistic creation and is quite simply a living picture created out of nature. 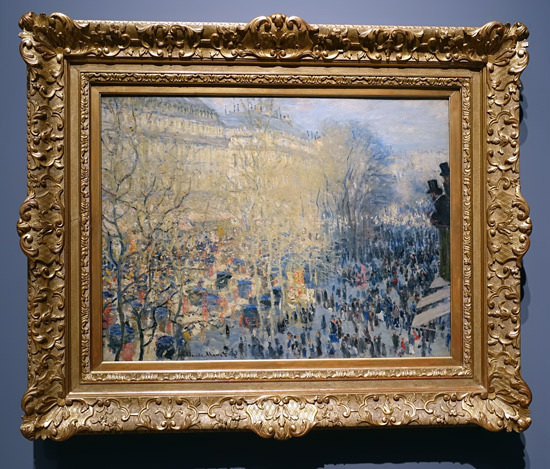 Gardens in Art: Monet's final Nympheas - This post is about the final and probably some of the most famous of Monet's paintings - the Grand Decorations which are now housed in the Orangerie Museum in the Tuileries Garden in Paris. They had a long birth. Gardens in Art: Monet - the story so far - This post summarises some of the lessons I've learned so far about Monet and includes a pastel painting which tries to exemplify some of things I've learned. Monet in the 90s: The Series Paintings by Paul Hayes Tucker. This book was produced for an exhibition of 'Monet's paintings in the 90s'. 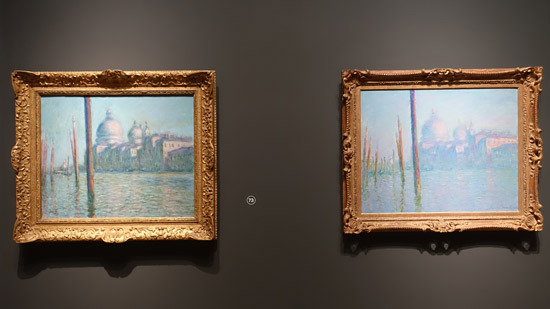 It proposes that Monet's series paintings also related to contemporary events in France and to Monet's determination to provide active leadership for his nation's artistic production. Monet in the 20th Century by Paul Hayes Tucker, George Shackleford. Covers the London and Venice paintings well plus the waterlilly paintings. I've found this book to be essential to understanding the background to and context of Monet's later paintings. It's actually the catalogue of a Monet exhibition that opened at the Museum of Fine Arts in Boston on September 23, 1998, before opening at the Royal Academy of Arts in London on January 21, 1999. Monet in Normandy By Richard Bettrell (192 pages) Rizzoli (June 27, 2006) This a catalogue of the 2007 exhibition of paintings Monet did of Normandy - an area he knew well as a child and later as an artist. Monet began his painting career in Normandy. It's where he met his first great mentor, Eugene Boudin. Monet developed a deep affection for the region and would return time and again to paint its dramatic coastline and seaside villages and resorts. The catalogue also takes a new look at Monet and examines some of his most important paintings, including the paintings of Giverny, the haystacks and the Rouen cathedral series. 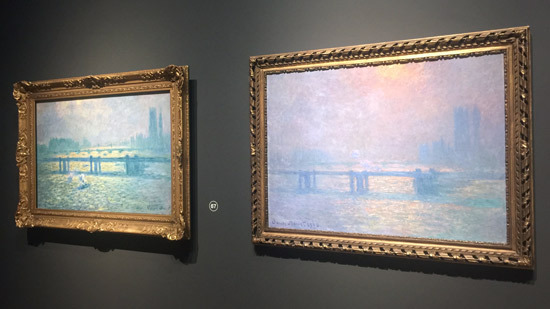 Monet's work is also considered in the context of other artists - Corot, Millet, Courbet, Whistler, and Boudin - and his fellow Impressionist painters - Morisot, Pissarro, Renoir and Degas.